Exploring Detroit's Belle Isle - A free guided audio exploration for your mobile device. The full-featured app employs GPS and helpful audio cues to guide you to over 40 points where narrations automatically provide details. This 2.5-hour guide is a combination car and walking exploration. Biking the 9.5-mile route is an excellent option, too! Explore it all or pick and choose. It's up to you! For the best experience, download the app and visit the park in person. If you just can't make it to the park anytime soon, use this button to check out the web version. 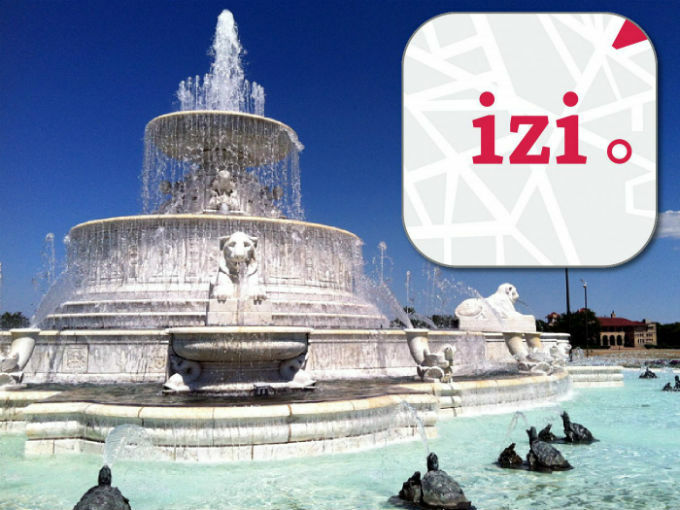 izi.TRAVEL gives you access to hundreds of free guided audio tours throughout the U.S. and around the world. To get Exploring Detroit's Belle Isle and our other Detroit centered tours, just download and open the app on your mobile device, then search for "Detroit." You can also choose Free Walking Mode from the menu to see a subset of our Belle Isle sites presented on a map (minus navigational guidance). For the latest tours, check out audioDtours.com! Audio-D's mission is to help you explore the history, art, and architecture of our favorite comeback city, Detroit, Michigan. As the D experiences its long overdue new-millennium makeover, the old stories become that much more important. Sharing them with our fellow Motowners and the rest of the world is our little contribution to the reboot at hand. Doing it for the love of the D! Audio-D Tours' mobile audio guides are free for personal use and there are no ads within the tours. Just note that the guides are copyrighted and no permission is granted for commercial use or incorporation in any other works. Audio production services provided through our friends at SuperVO.com. *Exploring Detroit's Belle Isle is not affiliated with the State of Michigan or any authority that manages Belle Isle State Park. Audio-D is not affiliated with izi.TRAVEL except that we make great guides that display in their awesome platform. If you're interested in a custom tour for your organization, indoors or out, drop us a line at feedback at AudioDtours dot com.